Hello and welcome to the simple plugin of, Pranker! 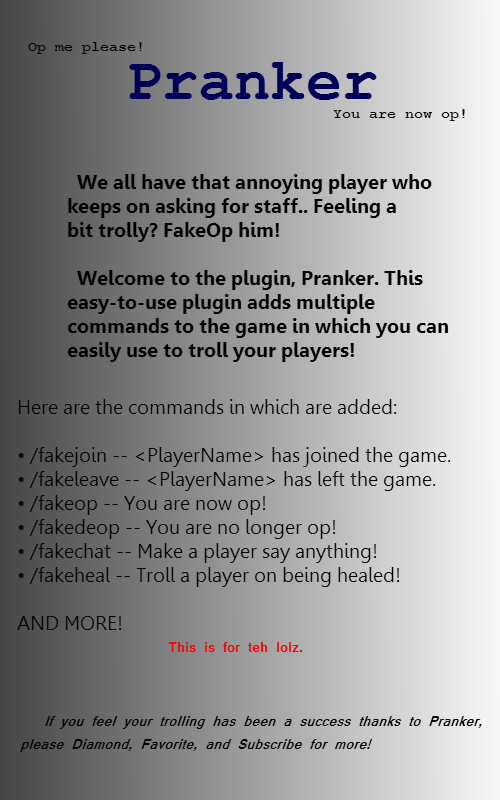 Pranker adds commands to your server to troll your players and friends! Ever wanted to tell that kid always asking for that he has OP now? We have a command for that! Ever wanted to have someone say something that YOU want them to say? We have a command more that! Please visit our BukkitDev for MORE commands! If you have a suggestion, please leave it in the comments below! Have fun and keep trolling! Thank you everyone for the Pop Reel! Updated for the current Minecraft version! Would you be able to release a source code? Im a developer for bukkit and i'd like to read over the code. On our Bukkit Dev post, it says that we will not be giving out the Source Code. My apologies. lol there is not much in it. its all just commands that display text. Does it really look like we care if we have 100+ lines of coding or not? Please, just leave. There Is Lots In It UnLike You Think There Is Maybe More Then 100 Coding In It The Commands Are Just InGame Commands There Is Lots Of Coding Behide The Commands Unlike You Think. how do I install this??? Download the .jar and then place it in your plugins folder. Restart you server, and it should be good! I did what you told me, and if I try to join my server, it says: Connection timed out: connect. Please submit a ticket on the Bukkit Dev. When testing it out on a server of our own, that is exactly what we did. That is how we caught our staff members slacking off! A lot of other people have made a minecraft plugin like this, but this one has extra features! http://dev.bukkit.org/server-mods/littletroller/" Yeah, you were offering Purevega thinking he was the plugin maker. When in fact I am he is a friend of mine who made this post for me and I thank him for that. So I was coming too you, asking if you wouldn't mind if I did that. Oh jokes yea sure ill pm you a link to the source :), sorry i thought you were a completely different person xD haha sorry. Alright thanks, just tell me when. /fakechat someguy I don't really want to be op. /fakechat SkyTheKidRS Hey guys! I found this server and I decided to play it for awhile! can you use this on anyones sever or has to be you're own. if you can use it on any sever that would be awesome. This not a Mod, but a Plugin. If the server has this downloaded, and the permission nodes are given to your Group, then yes you can use them! Then it is your choice not to download this Plugin, I'm not forcing you to. It's merely your choice to do so.